The Four Foundations of Mindfulness are a crucial teaching in the Buddhist tradition. As well as constituting the definition of Right Mindfulness in the Eightfold Path, they feature in the Satipaṭṭh&amacr;na Sutta (MN 10) and the Mah&amacr;-Satipatthana Sutta (DN 22). 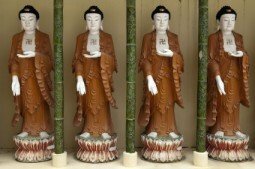 The four Satipaṭṭh&amacr;nas form an important part of the &Amacr;n&amacr;p&amacr;nasati Sutta, which is itself a key teaching. Additionally there is whole section on the satipaṭṭh&amacr;nas in the Saṃyutta Nik&amacr;ya, containing 104 discourses. The satipaṭṭh&amacr;nas are of course frequently referred to by many teachers, and entire books have been based around them. Lastly, the practice of the four satipaṭṭh&amacr;nas is described in the canon as the “direct path” to Nibb&amacr;na, emphasizing their importance. Even one author will not be consistent in their explanations. Bhikkhu Bodhi has two subtly different version above, and Sangharakshita has also parsed the Four Foundations as Body, Feelings, Thoughts, and Objects of the Mind’s Attention. The only one of the satipaṭṭh&amacr;nas that is universally straightforward is the first: the body (k&amacr;ya). While I’ll describe each of the four satipaṭṭh&amacr;nas in more detail later, we can note that the second, vedan&amacr;, is best described as “feeling” and not as “sensation” (as is sometimes seen) or (with the greatest respect to Sangharakshita) “feelings and emotions.” The third satipaṭṭh&amacr;na, citt&amacr;, means “mind” and of course this involves both thought and emotion. It’s the last term, dhamm&amacr;, that causes most confusion. For one thing, the word dhamm&amacr; is famously broad. For example, it can refer to “reality,” or it can refer to the system of paths and practices that lead to the perception of that reality, or it can refer to something more like “things” or “phenomena.” Some interpreters (Goldstein, Sangharakshita) have chosen to go with the interpretation of “dhamm&amacr;” as meaning “reality.” Others (Thanissaro, Bodhi) have gone with the interpretation of dhamm&amacr;-s as being mental phenomena. Some writers leave it untranslated, which may or may not be helpful. I will review the canonical account of the satipaṭṭh&amacr;nas to get a clearer idea of what the four foundations are, but before doing that I want to look at how the four satipaṭṭh&amacr;nas are understood collectively. What, in other words, is the point or purpose of the teaching of the four foundations of mindfulness? While these descriptions are selective, the four satipaṭṭh&amacr;nas seem to be regarded primarily as a handy way of breaking down the totality of our experience so that mindfulness can be developed in a comprehensive manner. The word “comprehensive” is in fact used frequently to describe the four foundations. While it’s true that the satipaṭṭh&amacr;nas are comprehensive, I think that to see them primarily in this way is a distortion of their true nature, which is as a way of observing a process. But before returning to how the satipaṭṭh&amacr;nas can be seen as a way of observing a process, I want to examine what each satipaṭṭh&amacr;na is, or at least how it is described in the suttas. The monk is to “remain focused on the body in and of itself.” According to Thanissaro “in and of itself” means “viewing the body on its own terms rather than in terms of its function in the context of the world.” In other words we see the body without reference to our judgments of whether others may see the body as strong or weak, ugly or beautiful, etc. This means that we are primarily sensing the body, and also reflecting on the impermanent nature of the body. This involves, according to the Satipaṭṭh&amacr;na and Mah&amacr;satipaṭṭh&amacr;na Suttas, of paying attention to the breathing, to the body’s postures, movements, and anatomical parts, as well as to the elements of which is composed and its impermanence (through comparison of one’s own body with decomposing corpses). It’s not always explicitly noted in the suttas, but in paying attention to the body we are of course paying attention to the sense organs — both the internal sense organs that allow us to know the breathing, etc, and the sense organs that allow us to perceive the external world. Feelings include painful, neutral, and pleasant feelings that may be “of the flesh” or “not of the flesh.” But this brings up the question of what feelings (vedan&amacr;-s) are. The two things vedan&amacr;-s need to be distinguished from are sensations and emotions. The coolness and firmness experiences in touching a cool surface on a hot day are sensations. These are direct sense impressions. However, such a contact will tend to be experienced as pleasant, and the pleasant quality of such a contact is a vedan&amacr;. And so on with the other physical senses. (Nocioception — the perception of pain — as when one pricks one’s finger would be a painful vedan&amacr; “of the flesh,” but is also a sensation. However, sensations more generally are not themselves vedan&amacr;, although they may be accompanied by them). Citt&amacr; means “mind” but not in an exclusively intellectual sense, since it includes emotions as well as mental qualities such as expansiveness, concentration, etc. In mindfulness of citt&amacr; we are told that the monk knows when the mind has has passion or is without passion, has aversion or is without aversion, has delusion or is without delusion, is constricted, scattered, enlarged/unenlarged, surpassed/unsurpassed, concentrated/unconcentrated, released/not released. Citt&amacr; might best be described as “the mind and mental states” or just as “mental states” since it doesn’t seem to be possible to experience the mind independently of its constituent mental states. We now begin to encounter one reason why understandings of the satipaṭṭh&amacr;nas are so variable, for the details we’re given of the dhamm&amacr;-s we’re to notice seem partly to duplicate the category of citt&amacr;. According to Thanissaro, in the Abhidhamma Vibhaṅga and in the Sarv&amacr;stiv&amacr;da version of the Satipaṭṭh&amacr;na Sutta, only the five hindrances and the factors for Awakening (bojjhaṅg&amacr;) are enumerated as objects of mindfulness. But what are these if not factors of citt&amacr;, the earlier satipaṭṭh&amacr;na? In the P&amacr;li Satipaṭṭh&amacr;na and Mah&amacr;satipaṭṭh&amacr;na Suttas, other lists are also given in addition to the hindrances and bojjhaṅg&amacr;-s: the five aggregates and the six senses (the usual five plus the mind sense). Thanissaro Bhikkhu points out that some scholars consider the Sarv&amacr;stiv&amacr;da and Vibhaṅga accounts to be closer to the original understanding of the dhamm&amacr; satipaṭṭh&amacr;na, the Pali sutta accounts having been expanded. It strikes me as quite likely that those scholars are correct. The term “dhamm&amacr;” is sometimes translated in this context as “Reality” — perhaps in order to overcome this duplication — but more often commenters realize (correctly, I think) that it is mental factors that are being referred to, even though this would seem to add redundancy to the list. And perhaps it’s that redundancy that leads some writers to ignore the traditional descriptions of the satipaṭṭh&amacr;nas; after all, it’s natural to assume that the satipaṭṭh&amacr;nas are a coherent system, and therefore to make them systematic, even if that means fudging the terminology. If we bear in mind that the body is the seat of the sense organs, and therefore is the vehicle for phassa (sense contact) we have a sequence that is perhaps beginning to look familiar: contact, feeling, mental events. We can recall the well-known “12 nid&amacr;na-s” — a series of cyclical conditionality that includes the nid&amacr;na-s of contact, feeling, and craving. Contact arises on the basis of the body and its sense organs. Feeling arises on the basis of these sense contacts, as we seek to divine value (positive, negative, or neutral) among those contacts. In the 12 nid&amacr;na-s, the mental state of craving is described as arising on the basis of feeling. The craving that arises on the basis of vedan&amacr; (as enumerated in the list of twelve nid&amacr;na-s) is however just one of many emotional/cognitive states that can arise on the basis of vedan&amacr;-s. Typically an unpleasant vedan&amacr; will give rise to emotional states of aversion or ill will (and accompanying thoughts). A pleasant vedan&amacr; will typically give rise to emotional states of craving (and related thoughts). And neutral vedan&amacr;-s will tend to give rise to boredom, restlessness, or confusion (plus, of course, the thoughts that accompany those states). While the function of vedan&amacr;-s is to assign value to sense contacts, the function of our emotional and cognitive states is to generate action. To give just one example, when we see (a sense contact) a driver suddenly pass us at high speed, we may experience a knot of tension or fear (a vedan&amacr;) arise, and in response to that we feel anger (an emotion) accompanied by thoughts such as “how dare he!” These thoughts and emotions may lead to our yelling abuse at the vehicle that is by now vanishing into the distance. This ties in with the next link in the nid&amacr;na cycle: grasping. Again, grasping is just one example of an action — one that arises on the basis of craving — but all of our actions arise from emotions. The chain of contact -> feeling -> emotion/thought is the prime driver of our experience, and is arguably the most important contribution that Buddhism has made to the field of psychology. As we’ll see shortly, it’s by first being aware of that dynamic, and second by intervening intelligently in it, that we can shape our experience and move from the generation of unskillful to skillful states of mind and, eventually, from Saṃs&amacr;ra to Nibb&amacr;na. The point I would like to stress now, however, is that the first three satipaṭṭh&amacr;nas correspond to the contact-feeling-emotion series. Those three satipaṭṭh&amacr;nas would then seem to be, at the very least, a training in the recognition of a crucial aspect of psychology. They represent a progressive training in recognizing each of the three stages in the formation of our mental states — our emotional and cognitive “inner climate.” And since it is this inner climate that leads to our actions, cultivating an awareness of the first three satipaṭṭh&amacr;nas would lead to our being more aware of the process that leads to our actions (kamma, both skillful or unskillful) in the world. Because the nature of contact is to condition feeling, and the nature of feeling is to condition emotion and thought, and the nature of emotion and thought is to condition action, in cultivating each of the first three satipaṭṭh&amacr;nas we are in fact cultivating, stage by stage, an awareness of a process. This, I believe, is the true purpose of the first three satipaṭṭh&amacr;nas. They are not merely a convenient way of slicing up our experience so that we can examine it in a comprehensive way. Rather, they are a way of coming to recognize how we generate action (skillful or unskillful), and the inner climate of experience that leads to our actions. This may or may not be a novel way of seeing the first three satipaṭṭh&amacr;nas, but I haven’t come across any previous explanation of the foundations of mindfulness that recognize that we are learning to pay attention to a process, rather than merely to three aspects of our experience. But what about the fourth satipaṭṭh&amacr;na of focusing on dhamm&amacr;-s, with its seeming duplication of the contents of the citt&amacr; satipaṭṭh&amacr;na? The fourth satipaṭṭh&amacr;na, you’ll recall, includes (at least) the five hindrances and the seven bojjhaṅg&amacr;-s, or factors of awakening. The five hindrances are a catalog of unskillful mental states (sense desire, ill will, restlessness & anxiety, sloth & torpor, and doubt). These states hinder us from achieving jh&amacr;na, or the progressive unification of the mind that ends in the (temporary) experience of deep peace (also known as equanimity, or upekkh&amacr;). The seven factors of awakening on the other hand are a progressive series of skillful mental states (mindfulness, investigation, energy, rapture, tranquility, concentration, and equanimity). These factors are shorthand for a process starting with becoming mindfully aware of one’s experience (whether skillful or unskillful) and cultivating jh&amacr;na, which culminates in equanimity. Jh&amacr;na itself is a prerequisite for Awakening (bodhi) and so the bojjhaṅg&amacr;-s are factors that lead to Awakening. The name bojjhaṅg&amacr; is in fact a compound of the two words bodhi (Awakening) and aṅga (factor). The five hindrances and the seven bojjhaṅg&amacr;-s are in several places in the Pali canon seen as antitheses. One set keeps us from jh&amacr;na, while the other leads us through jh&amacr;na into equanimity. One set represents unskillful states that bind us to Saṃs&amacr;ra, while the other is comprised of skillful states that lead to Nibb&amacr;na. It’s the neatness of this pairing that leads me to wonder whether the dhamm&amacr; satipaṭṭh&amacr;na section of the Pali Satipaṭṭh&amacr;na Suttas have been affected by what I’d call “commentator bloat” (i.e. the tendency of commentators and oral reciters of the texts to include other material that they deem relevant to the topic on hand), whether or not it’s strictly relevant. The Buddha said he “only taught one thing: suffering and the end of suffering.” The four noble truths are an enlargement of this principle, and point to what causes suffering and what leads to freedom from suffering. Observing the dhamm&amacr; satipaṭṭh&amacr;na thus means not merely recognizing the presence or absence of skillful mental states (the bojjhaṅg&amacr;-s) and unskillful states of mind (the hindrances) but in recognizing the dynamic whereby the latter keep us in a state of suffering while the former free us from suffering. While the first three satipaṭṭh&amacr;na are a training in recognizing how sense contact via the body leads to feelings, and feelings lead to the inner climate of mental states, the fourth satipaṭṭh&amacr;na is a training in recognizing how our mental states and processes lead us deeper into or lead us away from the experience of suffering. The fourth satipaṭṭh&amacr;na involves cultivating mindfulness of both the unskillful dynamics that arise as we cycle among the hindrances, and the skillful dynamic that emerges as we still our mental turmoil and move, via the jh&amacr;na-s, toward equanimity. The essence of the dhamm&amacr; satipaṭṭh&amacr;na, I would argue, is not any particular list of positive or negative mental states, nor any particular combination of such lists. Instead, I believe the essence of the dhamm&amacr; satipaṭṭh&amacr;na is the principle of observing the four noble truths as they manifest in the mind: observing suffering and how it is caused, and observing the cessation of suffering and how such cessation comes about. There is therefore only an apparent duplication in the third and fourth satipaṭṭh&amacr;nas. The third satipaṭṭh&amacr;na (citt&amacr;) involves mindful awareness of mental states as they arise on the basis of vedan&amacr;-s. The fourth satipaṭṭh&amacr;na is a mindful observation of the process by which these mental states lead toward, or away from, suffering, and toward, or away from, Awakening. While the citt&amacr; satipaṭṭh&amacr;na involves noticing the mind and its mental states, the dhamm&amacr; satipaṭṭh&amacr;na involves noticing the spiritual-psychological dynamics in which mental states are involved. The five hindrances and the seven bojjhaṅg&amacr;-s “work” as examples of these suffering-creating and suffering-overcoming tendencies, but they are just examples, and other examples would be equally useful. The satipaṭṭh&amacr;nas are therefore not a simple “comprehensive schema” for the development of mindfulness. They involve the observation of the dynamic whereby contact gives rise to feeling, which gives rise to mental states. They also involve the observation of the dynamic whereby those mental states lead toward or away from liberation. Again, this may or may not be a novel observation, but I’m not aware of other commentators having regarded the satipaṭṭh&amacr;nas as a training in the observation of psychological dynamics. My interpretation, however, seems to draw greater meaning from the teaching than can be gleaned by seeing them as simply four areas of experience to be examined mindfully. In fact, the more common way of seeing the satipaṭṭh&amacr;nas results in the confusion of terms that I highlighted above, where it is hard to explain the relative roles or status of the citt&amacr; and dhamm&amacr; satipaṭṭh&amacr;nas. remains focused on the phenomenon of origination with regard to the body, remains focused on the phenomenon of passing away with regard to the body, remains focused on the phenomenon of origination & passing away with regard to the body. It’s likely here that “origination” and “passing away with regard to the body” refers to the ongoing arising and passing away of physical sensations, rather than to the arising and passing of the body as a whole. This more stripped-down account may be closer to the original intent of the teaching of the satipaṭṭh&amacr;nas, which I would argue focuses on the arising and passing away of sense contacts, which contacts lead to the arising and passing away of feelings, which in turn lead to the arising and passing away of mental states. The arising and passing of mental states would, in the dhamm&amacr; satipaṭṭh&amacr;na, be observed in terms of whether they were trending in a Samsaric or a Nibbanic direction. If other people insult, malign, exasperate, & harass a monk, he discerns that ‘A painful feeling, born of ear-contact, has arisen within me. And that is dependent, not independent. Dependent on what? Dependent on contact.’ And he sees that contact is inconstant, feeling is inconstant, perception is inconstant, consciousness is inconstant. His mind […] leaps up, grows confident, steadfast, & released. And if other people attack the monk in ways that are undesirable, displeasing, & disagreeable — through contact with fists, contact with stones, contact with sticks, or contact with knives — the monk discerns that ‘This body is of such a nature that contacts with fists come, contacts with stones come, contacts with sticks come, & contacts with knives come. Now the Blessed One has said, in his exhortation of the simile of the saw [MN 21], “Monks, even if bandits were to carve you up savagely, limb by limb, with a two-handled saw, he among you who let his heart get angered even at that would not be doing my bidding.” So my persistence will be aroused & untiring, my mindfulness established & unconfused, my body calm & unaroused, my mind centered & unified. This, then, is the ultimate purpose of the teaching on the satipaṭṭh&amacr;nas. We learn to observe sense-contacts (sensations) giving rise to feelings, with our mental states “de-coupled,” the mind imbued with equanimity, remaining at peace despite the most extreme provocation. And this outcome arises from first training ourselves to observe the dynamic of contacts giving rise to feelings, and feelings giving rise to mental states, and then observing the dynamics within our mental states, and encouraging the unfolding of jh&amacr;na states that support the arising of insight. The four satipaṭṭh&amacr;na-s are not observation of mere categories of experience that, taken together, offer a comprehensive overview of our experience. Rather, they are the observation of two important spiritual dynamics: our unfolding experience, and its movement toward or away from nibb&amacr;na. 2. The word sensation, although not inaccurate since feelings are sensed, tends to make one think of the more basic perceptions of color, sound, touch, etc. 3. SN 36.7, for example, tells us that feeling arises in dependence upon the body, but the nearly identical SN 36.8 tells us feeling arises in dependence upon (sense) contact. We can take it that in regard to the arising of feelings, “the body” and “sense contact” are synonyms. 5. The Buddha was neither a physiologist nor a neuroscientist, and so it’s not surprising that the categories he used don’t overlap exactly with those of modern science. 6. It actually doesn’t make any difference to my argument whether the list of dhammas has been expanded or whether, in these other sources, a larger list has been pared down. The essential point, as we will see, is that our mental states are to be examined in the light of a mindful awareness of the Four Noble Truths: how does the unfolding of our experience contribute to the presence or absence of suffering? 7. In its essence, this sequence of nidanas should be read as: contact – feeling – emotion – action (including the next nidana of “grasping” and seeing it as just one example of action). 9. Actually, the feeling of anxiety may pass so quickly into an emotion such as anger in this kind of situation that we may not notice the vedana at all. However, with training the vedana can be detected underlying the emotion even after the emotion is established, and with further training the vedana may be detected even before the emotion becomes established. 10. This is not to suggest that the more common way of looking at the satipatthanas — as various aspects of our experience, collectively allowing us a comprehensive overview of ourselves — doesn’t “work.” It’s clearly useful to become aware of the body, the feelings, and the mind. However, it’s even more useful, I would argue, to be aware of the body, and to notice the body’s sensations giving rise to feelings, and those feelings sparking off thoughts and emotional states. 11. Again, it doesn’t affect the point I’m making here even if the Satipaṭṭh&amacr;na Sutta has been added to. The addition of the khandhas reminds us that that system of analysis is yet another instance of a dynamic process being turned by the commentarial tradition into a “comprehensive” but static overview of our selves (see for example, Matthieu Boisvert’s “The Five Aggregates: Understanding Therav&amacr;da Psychology and Soteriology.” And the other list, the “sixfold internal and external sense media” is a vital part of the creation of our experience. Both the khandhas and the senses play important roles in the construction of our experience — including the creation of suffering and of non-suffering. 1. Mind precedes all mental states. Mind is their chief; they are all mind-wrought. If with an impure mind a person speaks or acts suffering follows him like the wheel that follows the foot of the ox. 2. Mind precedes all mental states. Mind is their chief; they are all mind-wrought. If with a pure mind a person speaks or acts happiness follows him like his never-departing shadow. 13. See Note 3, above. 14. However, I don’t wish to suggest that these other ways of paying attention tot he body are any less valuable. Mindfulness begins with an awareness of the body and of its sensation, postures, and movements. Awareness of the body helps to still the mind and pacify our more unruly emotions. This take on the Four Foundations of Mindfulness very refreshing, and it made sense not only of the teaching but also of my own sense of frustration over the years at my inability to get a grip on the teaching as a whole even though the first three foundations made good sense. I shall return to this reflection with greater clarity now. Thank you! Bodhipaksa, thanks for writing this article, I’ve been struggling with this concept a lot recently and I feel like reading this is giving me a framework or map for understanding what’s going on in my experience. I do have one question though – where would memories or imagination come into this model? When I am sitting it is these that take the place of the first element in the process (or so it seems through the cloudy perception I currently have). For example I might be meditating then think of a problem at work, then have an aversive feeling/vedana “gut sensation” to it and then go into mental states of anger or whatever. Is it that the body includes the 6 senses and memories/imagination come under the sense of mind? Or is it that memories/imagination come under mental states and phenomena and I don’t yet understand the model properly? If you can reply to this, thank you again! I’m replying on my cellphone and so this will be a bit brief. I think an initial memory that pops into the mind associatively is, as you suggested, a sense object of the mind. So it would fall into the body/contact category. But then as soon as we recall a memory, the recollection evokes vedanas, and that triggers off emotions and thoughts connected with the memory. Our emotions and thoughts can also become sense objects when we pat attention to them. Some thoughts are distasteful (and i would take distaste to be a vedana). Some emotions are pleasant to experience and others are unpleasant. So whatever we cognize becomes a contact that can lead to proliferation. These observations are based on experience and reflection rather than on study of the suttas (which tend to be thin on detail) or the commentaries (which tend to be nitpickingly detailed). Anyway, I think you’re right. Thanks for replying to my question Bodhipaksa, that really helped me to put my experience in context and understand better. The idea that things like memories can become an experience of the first category isn’t obvious at all but makes such sense in a dynamic model. Your model already gave me a good way to relate to my experiences in meditation this morning. Thanks again. Very many thanks for your time and effort in making your great thinking so clear, accessible and concise. I am in receipt of it with much appreciation !! I’m in the middle of a four week class on the 4 Foundations of Mindfulness and having trouble appreciating what’s behind the teachings. I think your interpretation may be my ticket out of confusion. I just barely got a hint of why focusing on vedana might be a “skillful” thing to do, and then had no clue at all as to how mindfulness of citta would build on that. I’m definitely feeling grateful for the Web right now. You’re welcome, Mike. It’s something that had puzzled me for a long time as well. I’m back again. I continue to find this material compelling, and I’m wondering if you could direct me toward an explanation of the different types of citta. I’m not even sure if “types” is correct word choice in this context! But what I’m really looking for is an explanation of what is meant by “surpassed” and “unsurpassed” and so on. You’ll find many explanations out there, although I don’t find any of them particularly satisfying. I’m going to email you a PDF of some notes I put together for the students in one of my Skype classes, which explains my take on “great mind,” “surpassable mind,” etc. Again, these four factors — great mind, surpassable mind, concentrated mind, and liberated mind — constitute, I believe, a progressive sequence of states, and not simply four loosely connected qualities of the mind. I explain the sequence, and how it unfolds experientially, in the handout. Questions about the handout would be most welcome. I’d be particularly interested to hear about anything that you think needs to be clearer. By the way, I just found Bhante Sujato’s blog, and he agrees that the Satipatthana Sutta has been expanded, with the hindrances and bojjhangas having been the original elements under the dhamma heading. Here’s a blog post about it. Thanks for all your generosity. I’ll read the blog post. Your pdf is particularly helpful after searching around the internet and not finding what I needed. I’ll try to write back with some helpful feedback. I’ve got a sick child right now, so give me a day or two. You’re welcome. And good luck with the sick child. I have two young ones myself, and I know what that’s like. I reread this piece recently and have found a lot of clarity “a-ha!”, particularly your explanation of the body, feeling, mind as a conditioned process. You not only elucidated the four satipitthanas but shined some light on the nidana teaching. Rather than being a direction to take the mind, or something to “create” within our mind, sculpt our awareness into fitting into the two systems, they seem like illustrations of very primal and simple processes that so much could built on in terms of application of further reflections for cultivating positive mental states. I would like some further assistance understanding what you mean to suggest of the dhamma satipitthana. My impression is that is a sort of keeping our ultimate intention in mind, keeping our intention for awareness in mind. Please let me know if that sounds correct. With that, it sounds like it encapsulates the pali sampajanna, as in “sati-sampajanna” which I have heard translated as mindfulness of purpose. I’ve been doing a lot of reflection on the dhamma satipatthana just today, as it happens. Dhammas in this context are “conditions” or “causative factors” in the sense of mental states. But we’re not just noticing mental states as things that are present (which is what we do in the citta satipatthana). We’re noticing mental states as conditions that support or give rise to other mental states. We’re concerned with a kind of dynamic psychology. This fourth satipatthana is where we put it all together, observing how experience comes into being, and noticing how reacting, or not reacting, to vedanas (feelings) changes the kind of citta (mental states) that we experience. So we’re aware on the one hand of how contact/feeling/mental states can (with unwise attention, ayoniso manasikara) lead to the hindrances, and (with wise attention, yoniso manasikara) lead to the unfolding of the seven factors of awakening. We’re encouraged to notice not just the presence or absence of the hindrances, but to understand how they arise, how to get rid of them, and how to prevent their arising in the future. All this is spelled out in the instructions given in the sutta. So there’s a considerable amount of psychological insight, or “right view” involved. The same is true for the seven factors. We’re to be aware of whether or not they’re present, how they are created, and how we can develop them further. Investigation (dhamma vicaya) of the nature of of our experience, including noticing skillful and unskillful mental states. Energy (viriya), where we engage with our experience, eliminating unskillful mental states and cultivating the skillful. Joy or rapture (pīti), which arises as we rid the mind of hindrances and cultivate jh&amacr;na. Calm (passaddhi) of both body and mind, which comes about both in jh&amacr;na and more generally in our lives as our samatha becomes stronger. Concentration (sam&amacr;dhi) a calm, one-pointed state of concentration of mind which allows us to reflect deeply, and to observe the arising and passing of our experiences. Equanimity (upekkha), to be able to face life with a calm mind and with tranquility, freed from clinging and aversion because we have accepted impermanence, are no longer grasping after “good” experiences and having aversion for “bad” ones, and because we have reduced or eliminated our identification with our experience. This is a progressive series taking us through samatha (calm abiding, which culminates in concentration) and into vipassana (insight, which is implied as the causative factor of equanimity). So I think you’re right to connect this with sati-sampanañña, which combines sati (knowing what’s going on) with sampanañña (knowing where what’s going on is taking you, and remembering where you want to go. Because we need, in bringing the bojjhangas to fruition, to have a sense of where it’s all headed. Having a sense of the fruition of a mental state clearly implies a sense of purpose, and a sense of direction. I’m deeply indebted to Bhikkhu Sujato, by the way. His paper on Satipatthana and the Evolution of the Dhamma Theory [pdf] contains a lot of information about the various versions of the Satipatthana (or its analogues). I was rather taken aback to find out that the satipatthana “refrain” appears to be an interpolation intended to recast some of the samatha elements of the sutta as vipassana elements. It’s rather disturbing that a sutta that is regarded as so crucial is, as Bhante Sujato outs it, a “Piltdown Sutta,” cobbled together with a particular religio-political purpose in mind. Sheesh! Thank you very much. Your clarification of dhammas as encouraging certain mental factors makes is very clear. They sound almost needless to mention, like if one is working with hindrances in meditation and working toward insight, they will pass through these factors. But as always, it is helpful, interesting, and more grounding to meditation to have it spelled out. I am going on the Anapanasati sutta retreat at Aryaloka in October and hope that these factors will be touched on. I also have a few more questions, if you would like to answer! Second, I have been trying, for a while, to understand Sangharakshita’s commentary on “sati” of “sati-sampajanna”. He talks quite beautifully in chapter 1 about getting in touch with one’s past and makes quite a convincing case for this as an aspect of sati. But I’ve never picked up this emphases before in any systematic discussion of mindfulness and meditation and it is not mentioned anywhere else in the rest of his book so I am trying to understand it in a systematic way in light of the four foundations of mindfulness. For example, how does getting in touch with one’s past relate to basic awareness of body and feelings? Furthermore, what are some ways to do this? Connecting with old friends, listening to music that defined earlier parts of life, revisiting where we once lived? Particular concerns I have in unearthing emotions and experiences related to the past are cultivating attachment and related emotions, and creating a false sense of purpose or sort of inflated sense self. I imagine this is quite a large subject, indeed, but perhaps it is feasible to explain it systematically in light of the four foundations of mindfulness? Perhaps it would further help to understand it in light of other mindfulness teachings to know how to use the other tools of mindfulness to go about connecting with the past? As I review the previous discussion, where you mention memory to Matt, my request to understand how to deal with memory using the tools of mindfulness is “sati”sfied. I am still interested, however, interested in making sense of Sangharakshita’s strong emphasis on reconnecting with our past as a significant part of sati-sampajanna. The book I was referring to was Living With Awareness, chapter 1, remembering. I don’t have that book to hand, but generally speaking sati-sampajañña is going to be involved in things like our ethical practice, our ability to commit to goals, etc. Without a recollection that we decided to try not to yell at people, our resolution not to yell doesn’t hold much weight, for example. So memory is an integral part of practice. I don’t know if that’s what Sangharakshita meant, though. Regarding the spiral path (12 positive nidanas) and the seven bojjhangas: I suppose I think of both lists as referring to both experiences that can arise in meditation, and as tendencies that we reinforce over a longer term. So concentration, as a bojjhanga or as a factor of transcendental dependent origination, is both a state we may attain in particular depth in a given session of meditation, and it’s also a personality characteristic that’s built up through practice. And these are co-dependent, since individual experiences, repeated, build up our character. And, following from that, both are equally important. Translating this into human experience, it seems that from simple awareness (mindfulness) one can use right view (labelling based on one’s understanding of the hindrances) to remove the hindrances (dhammavicaya) and free up energy. One then becomes more and more whole and healthy (rapture to calm) and is eventually in a position to really take a look at things (with knowledge and vision of things as they are, as spelled out in the spiral path but probably implied in the factor of concentration in the bojjhangas), to take responsibility, to see life, or aspects of it, as they are (which is an enlightened experience), and then come back to the world with more direction and focus. One tries to abandon wrong speech & to enter into right speech: This is one’s right effort. One is mindful to abandon wrong speech & to enter & remain in right speech: This is one’s right mindfulness. Thus these three qualities — right view, right effort, & right mindfulness — run & circle around right speech. Mindfulness provides an awareness of what’s going on in our lives. Dhammavicaya/Right View tell us what’s skillful and unskillful. And energy/Right Effort abandon unskillful thoughts, speech, action, and volition, and cultivate the skillful. As you say, this leads to the overcoming of the hindrances and the cultivation of jhana (summarized in the bojjhangas as joy, tranquillity, and concentration). And on the basis of concentration we develop insight, which is represented here by equanimity. Your ideas for study seem admirable! I have a loaded question for you that might seem only slightly related to your topic at first glance. The experience of awakening as illustrated by the seven bodhyangas is very down-to-earth and speak to the human condition clearly and most perfectly. Other aspects of enlightenment, however, do not seem down to earth and I would like to resolve them to my life. I am trying to practice Buddhism because what I do understand and have put into practice seems far superior to any other methods of personal growth in its breadth of consideration and down-to-earthness; thus I have faith that there is something to what I don’t understand. The characteristics that don’t seem down to earth to me and sit only on the fringes of basic buddhism are sort of expressed by the catthus, the successively opened “eyes” where only the third eye involves the insight of vipassana; the fourth and fifth seem to relate to magical powers, I think seeing into the past lives of others and then omniscience. I wonder how and why that fits in with the rest of basic buddhism. Personally I have no doubts about the existence of the supernormal mental powers, and don’t think they necessarily allude scientific understanding, but they don’t seem to speak to being human, as does basic Buddhism, which regards some supernormal powers as mundane and less important than awakening. But then how does one understand that in light of the magical powers that are “characteristic” of a Buddha, which I think are illustrated by the third through fifth catthus, as opposed to those that he happened to master that are regarded as mundane (like clairvoyance, mental communication, changing matter, duplicating his body, etc.)? Apologies for bringing this to you when I know that it may be resolved in my planned courses studies; I am just finally able to formulate my attitude to ask for help and see no reason to refuse easy answers when they are legitimate. I thank you for the clear reflection on the seeming overlap between the 3rd and 4th Satipatthana and possible ways to delineate these two aspects of study. I think further study of the overlap and differences between these two practices of mindfulness would be most helpful. Regrettably, for me at present commenting on the scholarly debates for one set of translations of the Pali terms versus another is beyond my skill set. But, I had become acclimated to the terms Maruice Walshe uses in his translation of the Long Discourses: Contemplation of Mind and Contemplation of Mind Objects. But when I turned to a commentary such as The Heart of Buddhist Meditation by Nyanapokika Thera, I found it difficult to follow his comments on how to actually work with the 3rd and 4th Satipatthana See page 73-75 in particular. Still I believe his comments concur with the general schema you outlined in your informative article. One way to further clarify instruction for practice of the 3rd and 4th satipatthana’s would be to develop very practical and detailed real-life examples of how to practice these two satipatthana’s. Although I think practice related to Insight Meditation and practice as prelude to Jhana states will be quite different. I look forward to visting your retreat center sometime soon. Thanks Bodhipaksa for an illuminating and insightful piece of work, most helpful. Thanks, Vimokshadaka. I hadn’t seen this article before. I like certain aspects of Ray’s presentation — especially the sense that “things” get subtler, less real, and more transparent the more we look at them. I also love the poetry of his descriptions. His account of the various foundations isn’t very traditional from a Nikaya point of view — it reminds me of Bhante’s Tantric Precepts, where a familiar teaching is presented in terms of energy. I quite like it, although in particular I think it misses something of what vedanas are. Ray’s emphasis is on the body, and on in a sense reducing everything to that. I don’t think he’s being reductivist in a materialist sense, of course, just that he sees all the foundations as ever-subtler manifestations of the body. I’m not sure I quite see it like that. I’ve realized that I don’t actually have a body. All I have are experiences that I interpret as being “a body.” (I wonder if that’s what the Buddha had in mind when he called the first fetter “sakkayaditthi” — “the view of a real body”). It’s hard to put these things into words. Anyway, in a sense, the body only really exists within the mind. But I don’t disagree that in a sense the mind is a subtler expression of the body. Both seem correct, which probably means that both are only partial truths, resulting from the underlying assumptions with which we look at our experience. A kind of insight came to me some time ago — I think of it as an insight because I feel piti-sukha every time I recall it: “The body and mind are one.” I think that’s why Ray and I can come to the same conclusion, while approaching it from different directions. I’ve realized that what I really like most about Ray’s presentation is that it’s expressed within a context of emptiness. My take is more in line with the Nikaya teachings, in which samatha evolves into vipassana. His is more based (of course) on a Tantric approach, in which emptiness is recognized earlier on. It’s deep. Very deep. I do like it. One last thing. When he says “Now we comprehend Saraha’s statement that within the body everything can be found,” I’m reminded of other reflections I’ve been allowing to soak in, about how the world is our experience of the world. Hence, the Buddha’s statement that the whole cosmos can be found in this fathom-long body. This is what I think the teaching of the 18 dhatus (six sense objects, six sense organs, six consciousnesses) is about: there is no separation of self and world, except in our deluded imaginations. That’s why the Buddha called this “The All.” To look at the self deeply is to look at the world; to look at the world deeply is to look at the self. So in the end, if I was going to try to reduce the mind or body or the world to anything, it would be this: experiencing. Experiencing is all there is. Hi again, I reread Ray’s article, even though he talks about it being a single process, he doesn’t seem to describe the fundamental process. Yes, it’s like he has the beginnings of something there, but hasn’t followed it through. – of the conditional process, and the path and goal. There is the case where a monk, when the mind has passion, discerns that the mind has passion. When the mind is without passion, he discerns that the mind is without passion. When the mind has aversion, he discerns that the mind has aversion. When the mind is without aversion, he discerns that the mind is without aversion. When the mind has delusion, he discerns that the mind has delusion. When the mind is without delusion, he discerns that the mind is without delusion. Some of those are volitions, but some (scattered, enlarged/expansive) are more states of mind. So I take mindfulness of citta to be a question of noticing what states (including volitions) are present. Though it seems the descriptions of the different foundations are not really hermetic, as it were (which I think you say yourself) – these are not separate things – so I still think the core of what we are concerned with here is really the volitional nature of what’s going on. But thanks for your input, there is certainly a question mark about it. Perhaps the thing is that volitions may be a broader idea than what we might think, and include states, etc. Which points to how widely we are creating our whole world through our actions. But it does seem to encroach on the fourth satipatthana, which is, like I say, because these are not four hermetically separate things. It seems implicit in what you say that Satipatthana really is a Four Noble Truths Meditation in practise. I’ve found this idea made explicit nowhere, which is strange – since it seems that this right here is the core of Buddhism. Directly in meditation we experience, in our body (kaya), how our own volitions (citta; craving, ill will and delusion) lead to the feeling of dissatisfaction (vedana), and understanding these conditional process we free ourselves from dissatisfaction (dhamma). I think it’s more that we practice mindfulness of the body, that this leads to mindfulness of the feelings that arise in the body (even so-called “emotional” feelings are primarily physical), and this leads to us noticing the volitions and other mental states that arise in response or reaction to those feelings. Then, observing the way this whole process unfolds, we can either see our experience arising in a “reactive” or “creative” way, to borrow Sangharakshita’s terminology. He discerns how there is the arising of unarisen sensual desire. And he discerns how there is the abandoning of sensual desire once it has arisen. And he discerns how there is no future arising of sensual desire that has been abandoned. He discerns how there is the arising of unarisen mindfulness as a factor for Awakening. And he discerns how there is the culmination of the development of mindfulness as a factor for Awakening once it has arisen. These imply a degree of mundane insight into how the mind works, and how to work with the mind. I should really read through this article again and see if I still agree with it! I think I’d put things quite differently now. So, yes “we practice mindfulness of the body, that this leads to mindfulness of the feelings that arise in the body (even so-called “emotional” feelings are primarily physical), and this leads to us noticing the volitions and other mental states that arise in response or reaction to those feelings. Then, observing the way this whole process unfolds, we can either see our experience arising in a “reactive” or “creative” way.” And then there are further steps in a reverse cycle – we notice how by dropping the unskilled volitions (such as sense craving) our feelings which are unsatisfying tend to reduce, and that way we walk the path to liberation from dissatisfaction. So we can see the dynamic process in both ways. Awareness of feelings leading to volitions and awareness of volitions leading to feelings. Infact, the second process, feelings caused by volitions, is the more important of the pair. Thanks to all for continuing this conversation, and that’s to the technology that sends me messages so that I can stay connected. It’s a great help!